On November 8th, the Church and the Franciscan world celebrate the feast of Blessed John Duns Scotus, a friar and medieval theologian/philosopher. Not a household name, Scotus is best known for his philosophical writings, but it is his theological perspective that has left the most impact. His theological writings on Mary form the basis for how we understand the Feast of the Immaculate Conception, and his writings on the preeminence of Christ are the basis for the celebration of the Solemnity of Christ the King. But it is also his reflection on the primacy of Christ that led to his asking about the Incarnation, or more specifically, why did the Word of God, the second Person of the Holy Trinity, become flesh? “In the beginning was the Word, and the Word was with God, and the Word was God… and the Word became flesh and lived among us and we have seen his glory.” (John 1:1,14) Certainly those verses and others, e.g. Phil 2:5-7, clearly speak to Jesus taking on our humanity, becoming one with us. But it doesn’t necessarily answer why. St. Athanasius (De Incarnatione, 4th century in Alexandria) explained that humans misused free will and sinned – losing goodness, introducing death to the world, and losing knowledge of God all because of Adam and Eve. The Incarnation was needed to restore original goodness to Creation, yet humanity must remain in the grip of death so that justice is afforded God. Athanasius reasoned that expiation (sacrifice to God for reconciliation) was needed in order to fulfill the Law and restore goodness. Only the Word made flesh could bring goodness again to creation, serve as an ambassador between God and man, and afford justice to God…all because of the Fall. The answer to the question, “Why the Incarnation?” was that because of sin, it was necessary that Jesus came to die for our sins. Conversely, if Adam and Eve had not sinned, there would be no need for the Incarnation. This was the “given” answer for centuries. The fall was the cause for needing the Incarnation in the first place. “He is the image of the invisible God, the firstborn of all creation; …all things have been created through him and for him. He himself is before all things, and in him all things hold together. He is the head of the body, the church; he is the beginning, the firstborn from the dead, so that he might come to have first place [preeminence] in everything. For in him all the fullness of God was pleased to dwell.” (Col 1:15-19) and “God is love.” (1 John 4:16) Scotus focused on the preeminence of Christ in love. So, Scotus asked the question: “Was Christ predestined to be the Son of God?” He answers affirmatively and, in the process, posed the question: “Does this predestination depend necessarily upon the fall of human nature?” It is true that Christ came as Redeemer – but was that the primary and first intended purpose? Scotus makes a distinction between the fact of Christ’s coming, redemption being accomplished, and the purpose of the coming. Something Athanasius did not seem to consider. The preeminence of Christ speaks to the nature of God as love and the creative action as an action of love; a love that is self-diffusing and is the cause of Creation and the amazing variety of life. Scotus concluded that each individual was intended by God and that God intended many created individual co-lovers of the divine persons. “Nothing can possess every perfection…as it does in you, O God, who are supreme among beings, the only one of them that is infinite. Communicating the rays of your goodness most liberally, you are boundless good, to whom as the lovable thing of all, every single being in its own way comes back to you as its ultimate end.” Scotus concluded that God predestined the human soul of Christ to the highest possible glory independent of any necessity (including the Fall). Christ was to be the preeminent co-lover of God, our model of holiness who witnessed to God’s love. Thus, God first predestined the soul of Christ to the highest glory, then foresaw the Fall, and lastly planned the means of redemption. Underlying this thought is the medieval axiom: What is first in intention is last in action. But what is last in action? Some say the Crucifixion, or the Resurrection, or even the Ascension, but what is last in action is our salvation and glorification. The Incarnation is the Word of God becoming one of us in order that we find the way home (not simply the garden of Adam and Eve), in free will, and in love so that we become “partakers of the divine.” For Scotus, this refers to the beatific sharing in the inner life of the divine persons. The purpose of the Incarnation is that God first intended Christ as preeminent in Creation so that human nature could be glorified so as to lead all back to God to share in the inner life of the Trinity. Sounds great, but…is this orthodox? It was affirmed by Pope Paul VI in his encyclical Almas Paren, in which he praised Scotus and the Franciscans for offering this explanation and reminding all that sin or no sin, we are loved – such is the divine love. If Adam and Eve had not sinned, the Word would have become flesh and dwelt among us, as one of us – because we are loved. The Incarnation was always the means for humanity, to become “partakers in the divine,” to follow Jesus home. 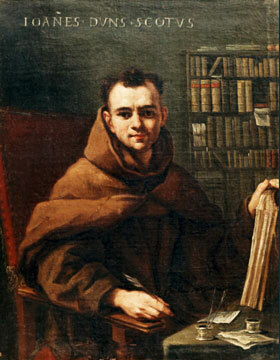 This entry was posted in Franciscan and tagged Incarnation, John Duns Scotus, partakers of divine nature by Friar Musings. Bookmark the permalink.